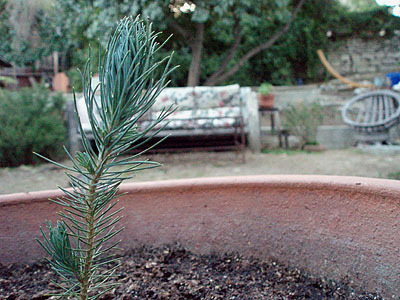 Morning Snap: Afghan Pine Sapling — 7:31 a.m.
With luck, attention and the proper mix of conditions, nutrients, and whatever else is needed for its success, I’m hopeful this little six-inch Afghan pine (aka desert pine, eldar pine) sapling that I transplanted into a nice-sized pot yesterday afternoon will grow to become a living Christmas tree for us to decorate either this year or the next and the next. And of course, I’ll be documenting its progress steadily as she grows. This entry was posted on Tuesday, January 9th, 2007 at 8:05 am and is filed under backyarchaeology, morning snap, nature, sequential. You can follow any responses to this entry through the RSS 2.0 feed. Both comments and pings are currently closed.